Route 66, a journey: Red alert! My biggest fear with SBS is not the distance. I can ride 1200K. Especially I can ride 300K, four days in a row. Just keep pedaling. My biggest fear is navigation. Specifically, getting lost. Disoriented in a foreign country. Under time pressure. With consequences. Since the accident navigation has been a problem and I'm working on it but sometimes, even in familiar surroundings, I get turned around. Good, precise directions are appreciated. The final route sheet for Super Brevet Scandinavia 2013. May the course be with us! Even more rare than getting lost is looking at the route sheet. Most people don't even carry it. Extra weight! SBS is a different story. Plenty of turns, no arrows. Mark Thomas had quite a bit to say in 2009 about navigational challenges. His Garmin saved him. After reading Mark's blog I thought, who needs a Garmin? A whole nest of problems in their own right. I'll have the route sheet printed out, saying at kilometer such-and-such, turn right. Those cool GPS files load into Google Maps! An iPhone is way more useful than a Garmin. I'll just whip out the phone and look for the pulsing blue dot. Compare it to the route. No problem! SBS wants you to study the route beforehand. Good idea. This will help. On closer inspection it quickly becomes clear that all the mileage numbers are for the green group. The red group gets special additions for the start and end of the first 3 days. But from the start of Day 1, if you're in the red group the mileage points are all off. Therefore it is almost guaranteed that this spatially-impaired blogger will get lost. Maybe I can just Tweet from the course and the twitterverse can get me back on track! I panicked a little. OK, a lot. It was last night and there might have been some screaming (at Danny) at (approximately) 11:46pm. At least one window was open too. Oh, the shame. 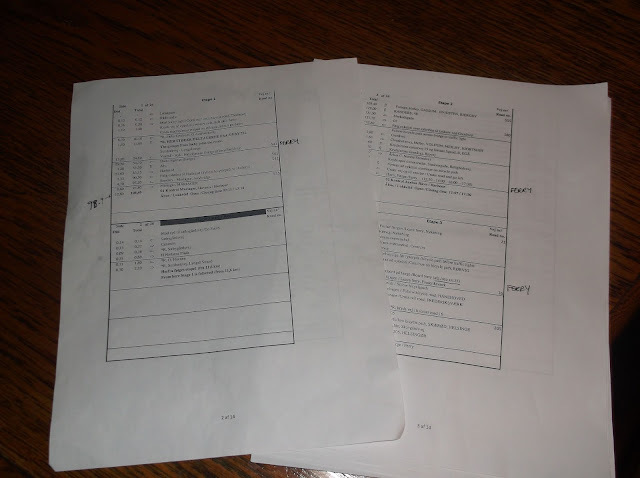 An email went off to the Danes, asking for the original spreadsheet used to make the route sheet. They very nicely and quickly sent it. So now, it's time to take a stab at a route sheet for the red group. It will take deciphering various sheets and formulas. There will be mad splicing of rows. If this works it's time to buy a lottery ticket. P.S. Fabulous spreadsheet hackers out there, feel free to get in touch! P.P.S. Any screaming deals on Garmins with next-day shipping, feel free to let me know!